The start of GC32 Marseille One Design was postponed on Friday 14th October due to the weather conditions. Pierre Casiraghi and his crew of Malizia, currently 4th of 11 at the general ranking are preparing to participate in the final stage of the GC32 circuit Marseille from 13 to 16 October. An international circuit of five appointments involve highly experienced crews in particular from the America’s Cup or the Olympic sailing. For his first race this season on new generation hydrofoil catamaran, the crew skippered by Pierre Casiraghi, composed of Sébastien Col, Boris Herrmann, Richard Mason and Adam Piggott, will have at heart to remain in the top 5. And competition will be tough. With 23 points, Malizia occupied 4th place in the overall standings before the leg in Marseille, and has a small one-point lead over the Swede Gunover Sailing (24 points), who are fifth, level on points with the French Team Engie and Americans Argo. Another battle for the title of the owner-helmsman since 2016 Pierre Casiraghi also holds a one-point advantage on Jason Carroll (Argo, USA). Let’s recall that it was Franck Cammas’ team and his crew of Norauto who lead the overall standings, followed by two Swiss teams: Team Tilt, skippered by Sébastien Schneiter and Armin Strom Sailing Team of Flavio Marazzi. Awaiting the start of the regatta postponed to Friday (October 14) due to a special weather bulletin strong wind for tomorrow, Pierre Casiraghi and his crew have been training on Wednesday. 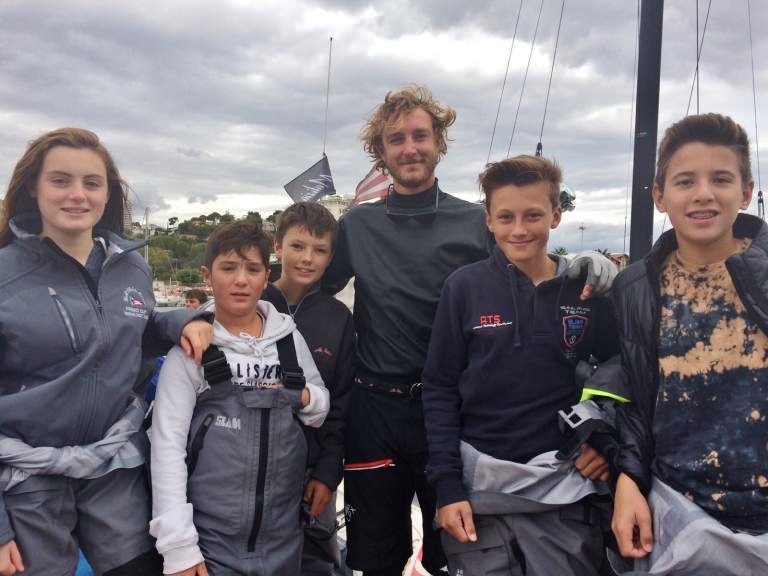 They welcomed the youth of the Sports Section of the Yacht Club de Monaco, who came specially to meet them. A special moment for these young sailors who were able to share and exchange freely with these professionals who make them dream.